A Utah man is in a bit of hot water after firefighters, responding to a report of a blaze, found half a dozen venomous snakes among 28 serpents in the individual’s home, located in Clearfield, north of Salt Lake City. The unidentified individual did not have a permit for the venomous snakes, which were uninjured in the fire. 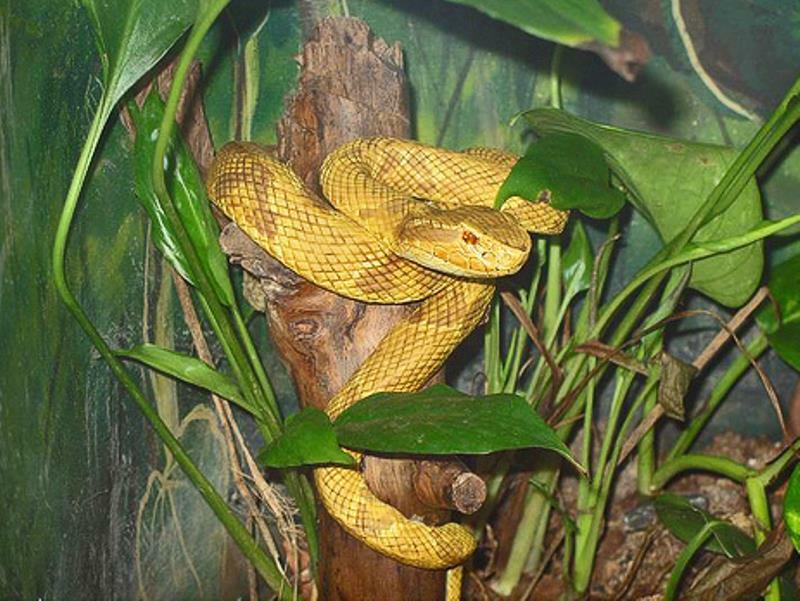 The vipers, which were kept in cages in a separate room, included five rattlesnakes, and, rather astonishingly, a gaboon viper, one of the most deadly snakes known to man. 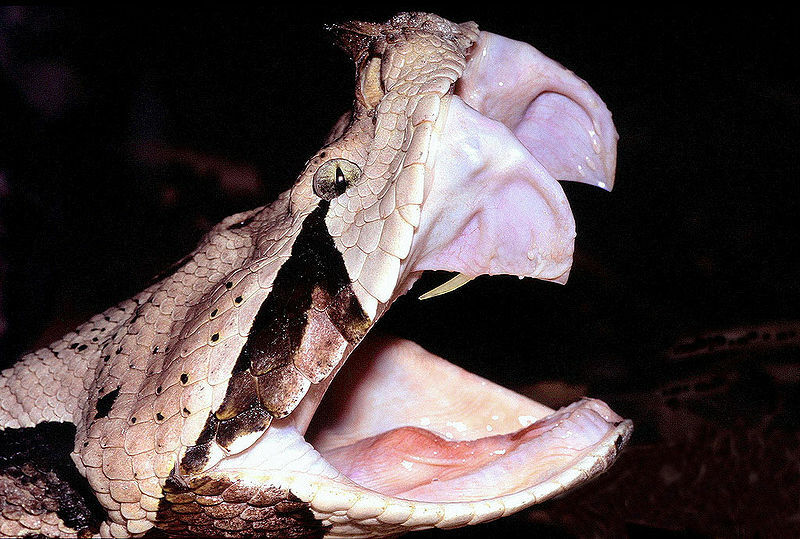 Gaboon vipers, which grow up to six feet in length, are native to sub-Saharan Africa, have fangs up to two inches long and possess the highest venom yield of any snake in the world. The snake’s bite can, not surprisingly, have a rather distasteful effect on humans, including: rapid and conspicuous swelling, intense pain, severe shock, defecation, urination, swelling of the tongue and eyelids, convulsions and unconsciousness. In addition, there may be sudden hypotension, heart damage and shortness of breath. The victim’s blood may become incoagulable with internal bleeding that may lead to vomiting of blood. Also, local tissue damage may require surgical excision and possibly amputation. Healing may be slow and fatalities during the recovery period are not uncommon. Nearly 70 years after the end of World War II, a campaign has been inaugurated in Germany to track down the final remaining Nazi war criminals and bring them to trial. 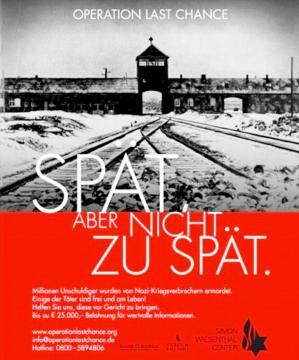 Some 2,000 posters featuring the entrance to the Auschwitz death camp are being displayed in Berlin, Hamburg and Cologne. They ask individuals with information to contact the Simon Wiesenthal Center, according to the BBC. The US-based Wiesenthal Center estimates there are five dozen war criminals – ranging from death camp guards to members of Einsatzgruppen, mobile death squads responsible for mass killings – still alive in Germany and fit to stand trial. As part of its “Operation Last Chance II” project,” the center is offering rewards of as much as $33,000 for information which helps in the prosecution of war criminals in Germany. Life has many wonderful things to offer: Impressionist art, Renaissance cathedrals and watching the sun set over a Pacific fogbank among them. 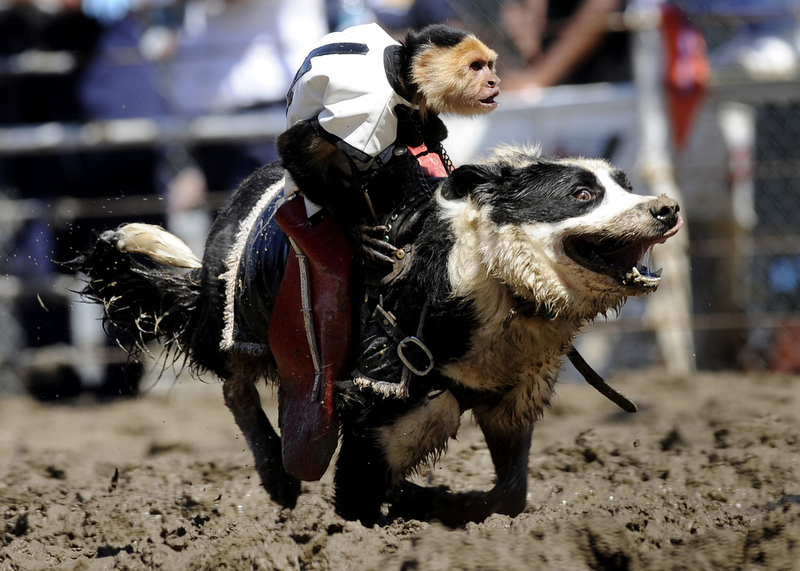 But for enjoyment and sheer wonder nothing tops the spectacle of a monkey riding a dog. There will always be naysayers, but whichever marketing guru came up with the idea of placing smallish primates atop a larger canines and then letting them dash off madly – well, that my friends, is pure genius. It is said there are a handful of things one should undertake in life if at all possible. These include visiting your nation’s capital, reading the classics and traveling, even if it’s within your own country. I would add that no list of must-do items is complete without witnessing the spectacle that is a monkey riding a dog. Don’t ask me why; it simply has to be experienced to be appreciated. William Faulkner’s oft-quoted axiom – the past is never dead. It’s not even past – is often applied to the South and its deference to history, especially its own. But occasionally come reminders of just how close to yesteryear we remain. Thomas N. Bruce, the son of Confederate soldier, died last Saturday in Knoxville, Tenn., at age 88. 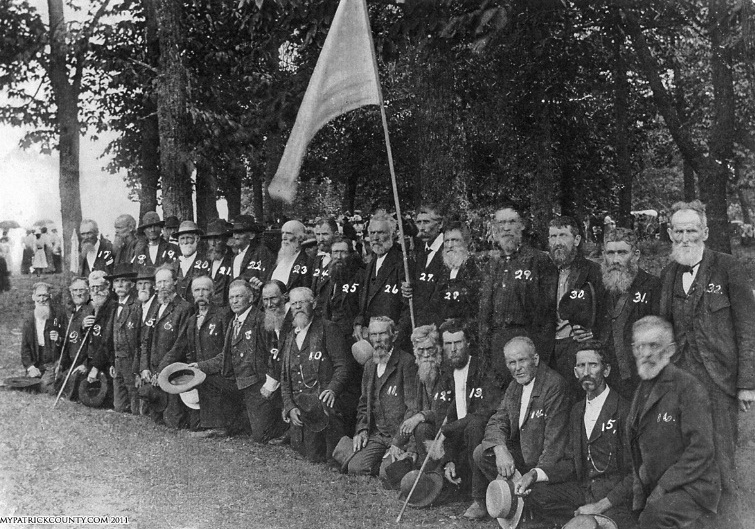 His father, Levi Newton Bruce, served in the 11th Virginia Battalion Reserves, enlisting less than a week after he turned 18. If that weren’t enough of a link to the past, Bruce’s great-great grandfather, William, served as a sergeant in the Continental Army. And Bruce himself had more than slight brush with history. Serving in World War II as an Army Ranger in the 66th Infantry Division, Bruce was one of more than 2,200 American servicemen aboard the transport ship SS Leopoldville as it crossed the English Channel on Dec. 24, 1944. A torpedo from the German submarine U-486 struck the compartment where Bruce’s Rangers were resting and nearly his entire company was killed by the explosion, according to his obituary. The scope of a recent discovery of sunken World War I submarines is so vast that it leaves one wondering whether initial reports are accurate. 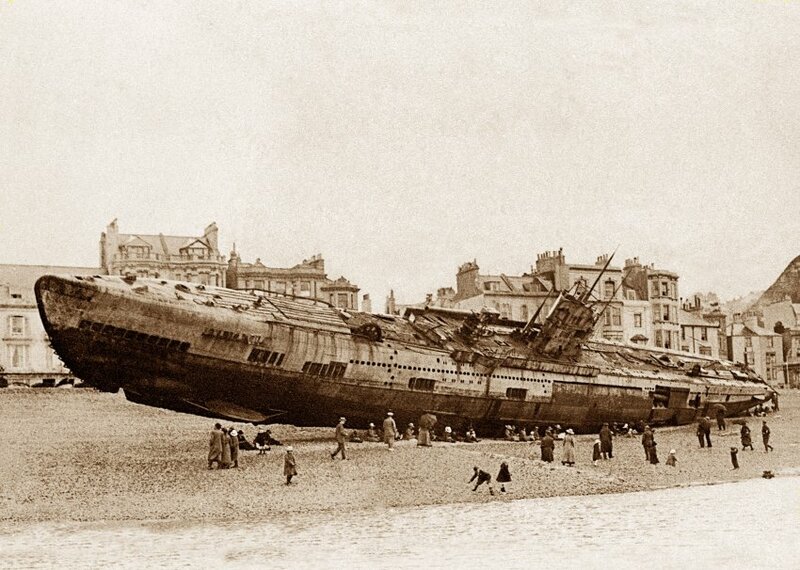 The German magazine Der Spiegel is reporting that British archaeologists have found more than 40 German U-boats and three English submarines sunk during First World War off the coast of England. Most of the U-boats sank with their crews onboard and several were still considered missing until their recent discovery, nearly a century after they were lost. “The marine archeologists were struck by the fact that sometimes two or three German U-boats were found lying in close proximity to one another,” according to the publication. “For historians, this serves as evidence of a certain German combat strategy in an especially drastic phase of the U-boat war. While German military strategists devised a plan to break up these massive convoys by attacking with several U-boats at the same time, what became known as a wolfpack, the strategy was difficult to implement in the Great War because it required the coordination of complex maneuvers. In all, British underwater archaeologist Mark Dunkley and three other divers found 41 German and three English submarines from World War I on the seafloor along the southern and eastern coasts of the United Kingdom. For just the seventh time in its 183-year history, the small European nation of Belgium has ushered in a new king, Philippe, who replaced his ailing father Albert II on Sunday. If history is any indication, Philippe can expect a lengthy reign. Of his six predecessors formally installed as monarchs since Belgium declared its independence from the United Kingdom of the Netherlands in 1830, all have reigned at least 17 years. The longest-tenured was a rather detestable individual named Leopold II, who took over in 1865 and ruled until his death in 1909. 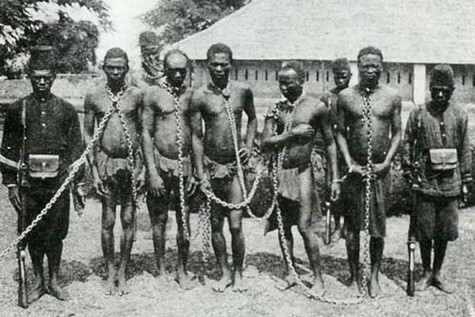 Under Leopold’s rule, Belgium exploited the Congo Free State for decades, resulting in the deaths of millions of native Africans in a harrowing bit of colonialism that is all but forgotten today. Leopold was envious of the colonial empires of other European nations and spent 20 years trying to acquire territory to satiate his desire for a far-flung realm. Thirty miles off the coast of Brazil and less than 100 miles from São Paulo, one of the world’s largest and most congested cities, lies a 110-acre subtropical island called Ilha de Queimada Grande. Sounds perfect for an idyllic retreat, right? No, not in this case. Ilha de Queimada Grande has a population of exactly zero. That would be because the Brazilian Navy prohibits anyone from landing on the island. Even fans of limited government would have to agree that the reason is a good one: Ilha de Queimada Grande is literally infested with one of most venomous species of snakes known to man, the golden lancehead. How infested, you ask? To the tune of one golden lancehead per square meter. For those of you who struggle with the metric system, that’s roughly one bad snake every 3-1/2 feet. The lancehead genus of snakes is responsible for 90 percent of Brazilian snakebite-related fatalities.